M. to F., 7:00 a.m.–7:00 p.m.
M. to F., 7:00 a.m.-7:00 p.m.
MacGregor Park is a marvelous facility comprising 82.79 acres on the southeast side of the city. The beautiful MacGregor Way parkways that line Brays Bayou from Almeda Road to Calhoun Road were designed as access roads to the park, and the entire complex became part of the city through bequests from the Henry Frederick MacGregor estate. MacGregor was a native of New Hampshire who came to Texas in 1873. After getting his bearings in Galveston, he moved to Houston a few years later and bought the Houston Street Railway, a public transit system dependent on donkey carts. He replaced it with electric streetcars, then sold the system and focused on his interest in developing and beautifying residential neighborhoods. MacGregor was responsible for extending the city southward, building some of the gracious neighborhoods that now make up Midtown Houston, the Museum District, and the area adjacent to Hermann Park. It was said that he was a firm believer in home ownership, extending credit beyond the accepted business practices of his day, at times lending money he never expected to get back in the interest of helping Houstonians escape foreclosure. His civic achievements in Houston extended to serving as president of the board of Hermann Hospital Estate after George Hermann’s death, pushing the construction of the Port of Houston, and donating land for MacGregor School. At the time of his death in 1923, he was eyeing the pristine forests along Brays Bayou, formulating plans for the best way to develop them for homes. In 1925, Elizabeth Stevens MacGregor and her nephews approached the city with a plan to accomplish MacGregor’s dream of a serpentine parkway along Brays Bayou ending in a new park downstream from Hermann Park. They presented a total of $225,000 for the project, with $80,000 for park purchase, $50,000 to improve it, and the balance to develop the parkway. The result was MacGregor Park and North and South MacGregor Ways, which became lined with elegant neighborhoods as the decades wore on. Peggy Park, which is named for Mrs. MacGregor, was also donated to the city by the family estate. MacGregor Park has sweeping expanses of picnic grounds and tree-shaded green lawns. 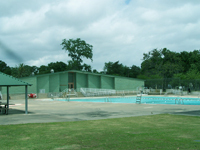 Facing Calhoun Road is a large swimming pool complex. A beautiful Mission-style community center graces the park, and outside it is the Peggy statue that once adorned Peggy Park. 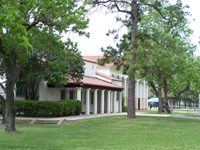 The center is a social mecca for neighborhood meetings and basketball games in the covered pavilion. 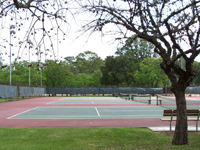 Nearby is the Homer Ford Tennis Center, one of the Houston Parks and Recreation Department’s premiere tennis education centers. Thousands of students have honed their skills under the able direction of the staff, and the courts are in constant use. The Levi Vincent Perry, Jr., Jogging Trail starts in MacGregor Park and runs up the bayou bank to Hermann Park. It is part of the trail system that continues upstream past the Medical Center to Gessner Street, for a total trip of 12.5 miles.